Went to target some whiting after pumping some yabbies on sunset days earlier. Decided to go early in the morning down to Port Hacking as I knew there would be a lot of people around with the Christmas break. Reached my destination at 9am, armed with only about 10 yabbies and about an hour’s worth of fishing. Had a few bites with little hook ups while leaving the rod resting on the rail. Decided to hold the rod for one try, and it was hit by a thumper which I thought at first was a bream. 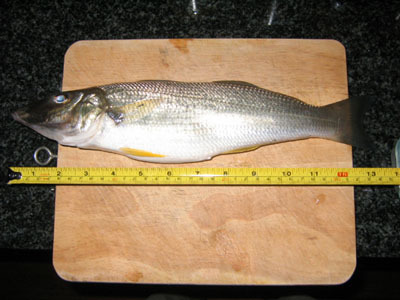 It fought like a small jewfish but when I brought it up, turned out to be a legal whiting measuring in at 34cm. Nothing much for the rest of the day, but a nice catch in an hour’s work.